Bennett Arron is an award-winning writer and stand-up comedian as well as a speaker on the subject of Identity Theft. 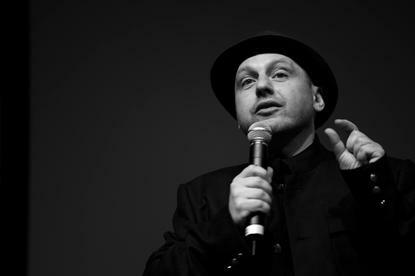 Bennett Arron-Bennett is an award-winning writer, actor and stand-up comedian and is the only Jewish/Welsh comedian on the Comedy Circuit. ID theft is quite commonplace now, but when it happened to me several years ago, no one really knew much about the crime. I had to convince the Police, as well as all the companies to which I allegedly owed money, that I was me, and not the person pretending to be me. Someone had used my name to ring up thousands of pounds worth of bad debts. This gave me a bad credit-rating which meant I couldn’t get a mortgage, couldn’t get a credit card and couldn’t open a bank account. I couldn’t even join my local gym as they wouldn’t accept my direct debit – so it wasn’t all bad news. As a result of this crime I eventually became homeless and penniless and had to move in with my parents. A few years after this happened, as some kind of cathartic exercise, I wrote a comedy show about the experience. As a result of this I was asked to be the guest speaker at International Fraud Conventions in the UK as well as Italy, Poland and Australia. I was also asked to make a television documentary on the subject. stall in a Shopping Centre and telling people that I could stop them from having their identity stolen if they gave me their personal details. Which they did (it’s online, have a look). The other thing I did in the programme was to steal the identity of the British Home Secretary – for which I was subsequently arrested…. Still at least I proved my point ID theft is a very, very easy crime to carry out. When I looked into my own identity theft, I discovered that the thief (I think the term Fraudster sounds too exotic) had been running up debts in my name for the previous year and a half. He hadn’t accessed my accounts, nor had he cloned my cards. He had simply used my personal information to set up new accounts. At a recent corporate event I was asked what people could do to stop them from having their identities stolen. I replied “nothing.” Needless to say, that didn’t go down too well. Of course there are preventative measures; shredding documents, not giving out information unless you are positive of the source, keeping your PIN safe, having regular credit reports etc. And in the vast majority of cases these will suffice. Yet, as I have proven several times, if I really wanted to steal someone’s identity I probably could. However, as I have already been arrested for it once, I am now looking into alternative hobbies. Of course, with the advent of social websites like Facebook, these crooks now have a new way of gaining personal information because as well as letting their families and friends know what they’re up to or what mood they’re in, people who use these sites have a tendency to add their address, date of birth and information as to when they are going away on holiday! But it’s not only down to the individual. Banks, shops, mobile phone companies etc should be more stringent in their screening processes. It’s too easy just to take on new clients and deal with any consequences of fraud later. Having your identity stolen is not a victimless crime. It’s far from it. And having a bad credit rating can cause endless problems. But don’t take my word for it, ask Bennett Arron…. as a speaker on the subject of Identity Theft.